The Great Northern War was one of the most important military and political events of the eighteenth century. It determined not only the future destiny of Ukraine but of Northern Europe as a whole. 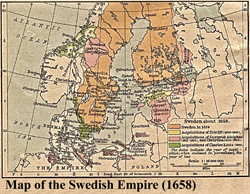 The extremely aggressive foreign policy of Charles's XII predecessors, particularly that of his grandfather Charles X Gustav , contributed to the transition of Sweden into a mighty empire, which controlled the majority of the countries bordering the Baltic Sea. The main objectives of Charles XI , the father of Charles XII, were the strengthening of the absolute monarchy and the development of Sweden’s economy. At the same time Sweden’s unceasingly aggressive foreign policy caused resentment and discontent in many European countries. Russia also suffered from the aggressive policy of its northern neighbor, having been forced to sign a peace treaty in 1617 that deprived it of any outlet to the Baltic Sea, the main European trade route. After Peter I ascended to the throne, the return of Russia’s former possessions along the Baltic became one of the most important goals of his foreign policy. In 1699/1700 Russia entered into an anti-Swedish alliance with Poland-Saxony and Denmark. 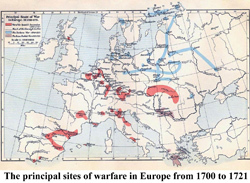 In August 1700, soon after signing a peace treaty with Turkey, Russia declared war on Sweden. At the same time, King Augustus II laid siege to the fortress of Riga. The Great Northern war that was to last 21 years had started. King Charles XII proved to be a worthy successor to the Swedish warrior kings in spite of his youth (he was only eighteen when the war started in 1700). He was a gifted military strategist and an inspiring and gifted leader. His goal was to defeat his enemies - one by one. His first target was Denmark. After leading a surprise attack on the City of Copenhagen and other Danish strongholds, he forced king Frederik IV of Denmark to sign a peace treaty with Sweden, leave the Russian-Polish alliance, and pay substantial retribution. After the defeat of Denmark, Charles XII moved his army to Riga , overcame the enemy's siege of the city, and then defeated the Russian army in the first major battle of the Northern War, the Battle of Narva , on November 19, 1700 (map of the battle). However, following these victories the Swedish King made a mistake when he refused to pursue the weakened Russian army, and instead, spent seven years fighting against the armies of Poland-Saxony under the command of Augustus II. This allowed the Russian Tsar to reorganize and modernize his army and bring it up to European standards. When Charles XII succeeded at last in defeating Poland-Saxony, and forced Augustus II, the Polish king, to abdicate in favor of Stanislaw Leszczinsky, leave the alliance and sign the treaty of Altranstadt, the army of Peter I had been turned into a powerful fighting force. The Russian victories in 1704 in the battles of Narva and Dorpat made it clear that Russia would be a formidable adversary. However, Charles XII continued to push into the Russian territories. In the summer of 1708 the Swedish army was in desperate need of supplies and ammunition. A detachment under the command of General Lewenhaupt had been ordered to deliver the much needed supplies from Riga. Expecting the supplies to arrive, Charles crossed the Berezina River with his army and started to move toward Moscow. However, Lewenhaupt’s detachment was defeated by the Russians in the Battle of Lesnaya, and the entire pack train was lost. Instead of delivering supplies to the hungry army, Lewenhaupt ended up delivering 6,000 equally hungry survivors of the attack. Charles’ only option was to turn south toward Ukraine and try to secure provisions from that area. When the war between Russia and Sweden became more intense, the Kozak Hetman Ivan Mazepa had sought to secure Ukraine’s safety. He had hoped that Russia and Sweden would fight their final battle somewhere outside Ukraine, but when the Swedish ally Stanislaw Leszczinsky began to threaten Ukraine, Mazepa asked Peter I for military protection. Preparing for his own inevitable battle with Sweden, the Russian tsar refused to become involved in Ukraine’s fight and, therefore, rejected Mazepa’s request. This was the last straw for Mazepa. The hetman regarded Peter’s refusal to assist as a breach of the Russian-Ukrainian Treaty of 1654 and, as a result, considered Ukraine to be free to act in its own best interest. In October 1708 Mazepa allied himself with the Swedish king, Charles XII, and entered into a military and political treaty with Sweden. About 3000 Kozaks followed him. In accordance with the treaty, Sweden pledged military support and agreed not to sign any treaty with Russia until Ukraine had been fully liberated and its rights restored. Tsar Peter’s reaction to Mazepa’s decision to join the Swedes was quick and cruel. Prince Menshikov , one of Peter’s commanders, destroyed Baturin, the Hetman’s capital, and massacred all inhabitants. This event forced many of Mazepa’s potential supporters to reconsider and once again change their allegiance. After an extremely severe and exhausting winter the Swedish army reached Poltava in the beginning of April 1709. Here the decisive battle of the Great Northern War took place on June 27, 1709. The Swedish army suffered a crushing defeat and lost about 6900 dead and wounded. The rest of the Swedish army, under the command of General Lewenhaupt, capitulated on June 30, 1709 near Perevolochna, and about 16000 Swedes were taken prisoner. The King and Hetman Mazepa managed to escape with a small detachment and took refuge in Moldavia, a country ruled at that time by Turkish sultan Ahmed III. However, the King’s flight did not end the war. It continued for another nine years. In the later years of the war, the battle moved to the Baltic. Russia’s fleet dominated its Swedish counterpart and added to Sweden’s total defeat. On August 30, 1721, Russia and Sweden signed the Treaty of Nystad. Russia gained Livonia, Estonia, Ingermanland, and part of Karelia. The Great Northern War ended Sweden’s position as the dominant power in Northern Europe and the Baltic Sea. This position was now taken over by Russia. As for Ukraine, the Great Northern War eliminated all hopes for independence. After the defeat of Sweden, the final absorption of the Kozak state into the mighty Russian empire was simply a matter of time. Because of the harsh winter of 1708/09 and a series of military defeats, the situation of the Swedish army in Ukraine had become precarious. In late April 1709 Charles XII decided to lay siege to the fortress of Poltava. Although the Swedish army consisted of about 31,000 men at the time, the king decided to engage only 4 cannons and about 6,000 of his soldiers in the siege. The Swedish army cut off all access to the city, including any possible approaches by the Russians across the Vorskla River. In contrast, the Russian Tsar commanded 49,000 men and about 130 cannons. Thus, the Russians had a substantial numerical advantage on the eve of the battle. When Tsar Peter I arrived from the fortress of Azov to join his army on June 5th, he decided to move the army to the western bank of the Vorskla. On June 20th all Russian units crossed the Vorskla near the villages of Petrovka and Semyonovka. The army then moved south and set up a fortified camp near the village of Yakivtsy. In front of the camp was a one-kilometer wide open field of dry, sandy soil, bordered by the Budyschenski Forest. A hundred meters south of the fortified camp lay the Yakovetski Forest, an area of woodland, streams and gullies. In the area between the two forests the Russians had built 10 redoubts to guard the approach to the camp. Each redoubt consisted of a high parapet with a trench in front of it. The redoubts were manned by 4,000 infantry men (8 battalions) and 16 guns. On the eve of battle, disaster struck the Swedes. Charles XII was wounded during a brief encounter with the Russians while on reconnaissance. This unfortunate incident deprived the Swedes of their charismatic and able leader - more than that, their talisman of victory. Although the King retained nominal command of the army, he had to delegate direct control to Field Marshal Rehnskold. The Swedish plan was simple. The army would assemble during the night south of the Russian redoubts and move through the redoubt line before dawn. The infantry troops under the command of Lewenhaupt would be the first to move forward through the redoubt line, followed by the cavalry. The foot soldiers would then launch an attack on the Russians crammed inside their fortified camp. The 18 Swedish battalions were divided into four columns, supported by a battery of four regimental guns. The Swedish infantry moved into position soon after midnight. Their starting lines were about a kilometer south of the first Russian redoubt, from which the sound of sawing and hammering could be heard. There they waited. When the cavalry finally arrived after two hours dawn was already breaking. By the time the whole Swedish army was assembled, the late start put the element of surprise at risk. After conferring with his two principal commanders, the King decided to go forward with the attack anyway. The time was about 4.00 a.m. The battle had begun. The battle started with the Swedes advancing boldly against the Russian fortified lines. 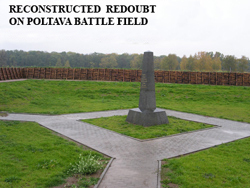 Two incomplete redoubts were taken rapidly and all the defenders killed. However, the Swedes’ initial success was quickly brought to an end. All assaults on the third redoubt were repulsed and the dead lay in heaps in the trench surrounding it. The Russian dragoons retreated to the north, pursued by both wings of the Swedish cavalry. General Lewenhaupt’s infantry attempted to attack the Russians and even reached the southern corner of their camp. But the Swedish advance soon faltered, because both infantry and advancing cavalry were ordered by Rehnskold to withdraw and reorganize. To make matters worse, one Swedish detachment, commanded by General Roos , had not been informed about the overall strategy and, therefore, became separated from the rest of the Swedish troops. When a column of about 4,000 Russian reinforcements reoccupied the fortified positions, General Roos and his forces were trapped. With over 1,000 casualties and ammunition running low, General Roos was forced to withdraw southward and later surrendered his command. As result of this lack of communication among the divisions, the Swedish army lost one third of its infantry before the real battle had even started. The Swedes delayed further action while waiting for Roos to return. Around 10 o’clock, when the Russians infantry started to move out of its fortified camp, the Swedes decided to also move forward. Because of their numerical superiority, the Russian front line was 400 to 500 meters wider than the Swedish one. In addition the Swedish flanks were not properly protected by the cavalry. When the Swedish infantry had advanced to within 200 meters of the Russian defenders, the Russian artillerymen switched to canister fire. The effect of this was likened to “a hailstorm,” mowing down entire lines of men. While the right wing of the Swedish army was pushed back by the Russian artillery, the Russian cavalry outflanked the Swedes’ left wing. The Swedish cavalry tried to buy the infantry time to get away but failed. The soldiers of Charles XII started to flee the field. The battle had become a slaughter and it was not yet 11 o’clock. Charles XII had no choice but to gather the remainder of his troops and retreat to the south, thus abandoning the siege of Poltava. More than 6,900 Swedish soldiers lost their lives on the battlefield that morning. Another 2,800 were being taken prisoner. Russian losses have been estimated at 1,345 killed and 3,200 wounded. Some trophies taken by the Russians in the Battle of Poltava, including cold steel, firearms, flags, drums and trumpets, were later moved to the Kremlin Armory.